Finding a reliable HVAC contractor in a busy metropolis like Dayton or Cincinnati is no easy undertaking but it’s a necessity, especially when it starts to get hot. The importance of having a heating and air conditioning company in your area that you can call on, can’t be understated. Whether you require heating or AC repairs, a pre-seasonal system tune-up or even a new system installation—having a company you trust is absolutely essential. This is where the experts at Airtron Heating and Air Conditioning come in. Airtron Dayton & Cincinnati has been a part of the Western Ohio community for more than thirty years, so you know you can trust us to handle all of your heating and air conditioning service needs. This is where the experts at Airtron Heating and Air Conditioning come in. Airtron Dayton & Cincinnati has been a part of the Western Ohio community for more than thirty years, so you know you can trust us to handle all of your heating and air conditioning service needs. There’s no denying it, winter in Dayton and Cincinnati can be brutal! Don’t get caught in the cold without a working home heating system. 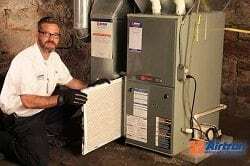 Our HVAC technicians are trained to handle all heating repairs and furnace installation. The last thing you want to worry about in the summer is your AC breaking down. Call our cooling technicians for fast and reliable air conditioning repairs or a new system installation. Regular and on-going system maintenance is absolutely essential when it comes to an efficient and long-lasting heating or air conditioning system. Protect your investment and purchase an Essential Plan for your home heating and AC system today. Thousands of homeowners rely on Airtron Dayton & Cincinnati for dependable heating and cooling all year round. But don’t just take our word. Read what your neighbors are saying about our services. The HVAC experts at Airtron Dayton & Cincinnati specialize in furnace and air conditioner repair and installation, including leading brands such as Bryant, Lennox, Carrier and more. Whether you are preparing your home for another frigid Ohio winter with a heating system tune up or maybe your central air conditioning has stopped working and requires immediate AC repair—Airtron is here to help. Our knowledgeable heating and cooling experts provide you with the necessary HVAC maintenance, heating and air conditioning installation services you require, ensuring that your broken home air conditioner is repaired, and that inefficient old heating system is replaced and a brand new, eco-friendly furnace is installed. 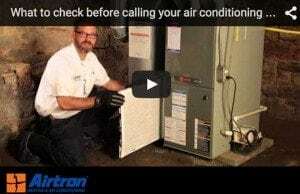 Airtron Dayton & Cincinnati wants to be your trusted heating and air conditioning service provider. Be sure to visit our heating and air conditioning pages to learn more about our services and see why Airtron has received an A+ rating from the Better Business Bureau. As always, the technician was on time and professional. 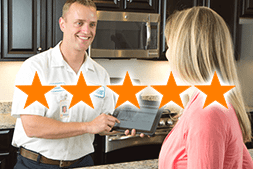 I like that we typically get the same service person coming repeatedly - it adds to my confidence (which is already very strong) that we are getting excellent service that we can always depend on. We would recommend Airtron to anyone without hesitation! Airtron has very capable and personable service professionals. I appreciate how responsive they were to our needs! I like that you offer a maintenance plan that sends someone twice a year to check and be sure everything is working properly. Your employees are great and explain anything to me that I have questions about. Very good experience with very responsive service. The only change that I would recommend is that the service technicians explain more in person while they are there. For one low monthly payment, Essential HomeCareSM covers more than just the equipment. It gives you peace-of-mind that if something does unexpectedly fail, you’re already covered. We do our best to ensure we are giving our customers the most consistent, courteous and Essential HomeCareSM Details.